For those who love the outdoors, the Overland Expo 2014 is the right Expo for them. This expo shows all of the latest in camping gear and outdoor vehicle accessories. For those who are into outdoor adventuring, they will surely be able to get the most out of this outdoor adventure. A Meet Up For Camping Enthusiasts. The great thing about this expo is that those who are coming all have a great similar interest and love of camping. The expo is a grand meetup that is similar to a big camp out with all of your buddies. Seeing a bunch of other campers from around the nation gives expo goers a great way to network and learn new and cool things about the camping experience. It is great to get new camping tips, and make new friends that you could go on new adventures with. 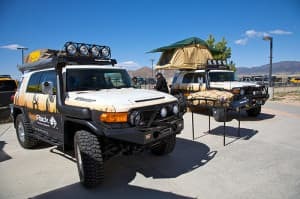 The Companies at Overland Expo. The top names in outdoor camping gear were at Overland Expo this year. These companies are the generous sponsors of this event, and they are what make this whole expo possible. The title sponsor for the event was four wheel pop up campers. This company offers the very best when it comes to pop up campers that can fit on the back of most pick up trucks. They are the industry leaders in pop up campers for pick up trucks. The other largest sponsor was Sportsmobile. They are a great company offering a wide selection of conversion vans that are great for travel and camping. Here is a list of the other larger sponsors that also made this expo possible. These are just some of the many companies that helped make Overland Expo happen. It is easy to see how this would be an incredibly fun even with all of these new products to take a look at.